Wullie Weir was a founder member of the UAAA in 2006 & the Clubs first and up until now only Chairman. Wullie has put countless hours into running the Association and was instrumental in setting up our Hatchery & Rearing ponds allowing the UAAA to uniquely produce Brown Trout from local broodstock & therefore ensuring the genetic integrity of the Avon Brown Trout. He has hardly been away from the “ponds” since 2006 & deserves a rest from his labours to get some fishing in. We need more volunteers like Wullie going forward to allow our organisation to prosper in the years ahead. 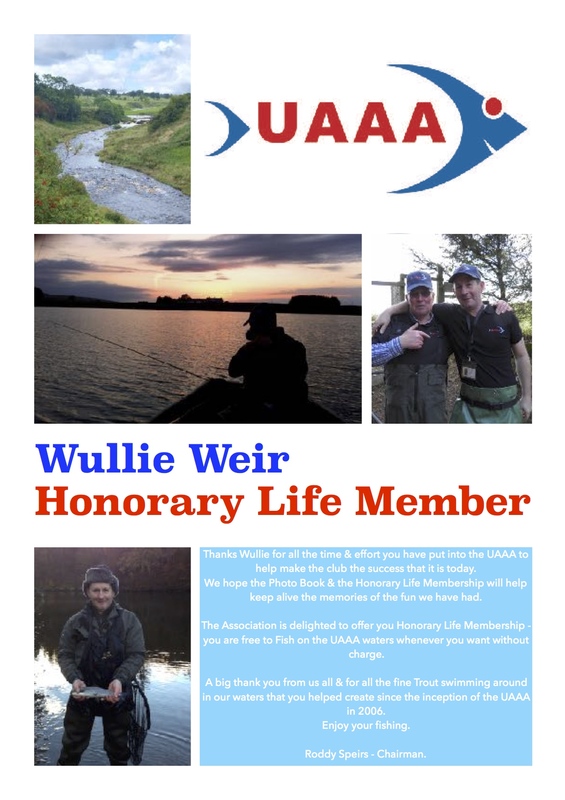 Therefore the UAAA is proud to make Wullie an Honorary Life Member which is the least we can do.